Content teams often have too much to do, and too few people to get it all done. For content marketers, that means we’re often asked to stretch our skill sets. Whether you need to create a new type of content or delve into a task you’ve never tackled before, you may not always know how to do everything you’re asked right away. Fortunately, learning new content marketing skills isn’t as hard as it sounds. In fact, it only takes 100 hours to develop basic competency at a given task. Plus, you don’t have to be a master right away. The secret to success is to just start. In this video, I chat with CoSchedule’s Content Marketing Lead, Nathan Ellering, to discuss how to overcome perfectionism and the fear of failure. Plus, you’ll learn the same skill development process the CoSchedule team used to build a blog that gets 1 million page views per month, an email list over 120,000 strong, and a fast-growing social media following. Garrett: I’m Garrett from CoSchedule and this is #OverheardAtCoSchedule, the show where we talk about the things that we talk about around the office, except for we turn the cameras on. It’s sort of like going out to coffee with the CoSchedule team. As a startup, one of the things we constantly have to do is learn how to take on a new skill and get better at it over time. I think there’s no better example of this than our marketing team, so I wanted to bring in Nathan. Nathan’s our content marketing lead here at CoSchedule. He manages our blog and a lot of other crazy stuff. I think you’ve outlined to me one of the best processes that I’ve heard for doing this, taking on a new skill. Why don’t you share that with everybody and break down how that works? Nathan: Definitely. As a marketing team, even content marketers as a whole, we are told that we need to do lots of things consistently in order to be successful. We need to blog consistently, we need to be doing social media consistently, we need to be publishing e-books consistently. The framework that we use for that at CoSchedule is by thinking about it as skill acquisition. Garrett: Sure. 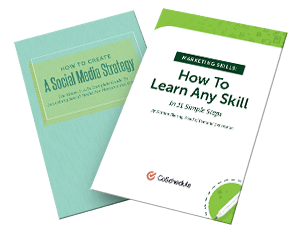 Blogging’s a skill, social media’s a skill, e-books, all skills that you have to acquire. Nathan: All skills, and you acquire them over time. There are three phases of skill acquisition. The first is that you just start. It sounds simple, but it’s hard to do for some people, but you have to start and you have to ship something, even if it’s not perfect. Nathan: Yeah, because that comes actually in a deeper phase of skill acquisition. When you first start something, which is the first phase, afterward is the second phase that you have to repeat that process and hone your procedure, and start removing errors from what you’re doing. In order to acquire skill, you have to repeat. You can’t do that your first time around. Nathan: Get better at it. Exactly. That core value actually goes into the third phase of skill acquisition, which is constant improvement. You go through starting, you improve and repeat, and then it’s mastery. Garrett: Yeah. Very nice. That mastery level … Is there a timeline for that? How does that work? Nathan: There’s a little bit of research out there that says it takes 100 hours to learn how to acquire a skill. That’s where the repetition comes in. Mastery, when you continuously improve, just comes over time. There’s not really … It’s just part of marketing consistency. Garrett: I think that’s a key insight right there. 100 hours, you’ve got time. You don’t have to have it right away. You can build this up. I think about how we publish blog posts. We were talking earlier about the number of tasks that are assigned to each blog post. It used to be three: write it, edit it, publish it. Now it’s like twenty. Nathan: Yeah. For example, how we’ve honed the skill of publishing blog posts consistently has been, you just start. We published blog posts, they might not have been the greatest things in the world when we first started, but we did it. Then we repeated our process and we started to hone our procedure. We upped our amount of tasks to make sure that we didn’t miss anything. We removed errors from our process. After that, we’ve been publishing consistently two times a week and we’re at mastery level now. Garrett: Yeah. I think the traffic levels have indicated that and the good response from our readers have indicated that. Nathan: Yeah. When you first start a blog, you might not get a lot of traffic or readers right away. But especially for us, we’ve come a long way. We have nearly one million monthly page views and over 100,000 email subscribers now. The results of building a skill speak for themselves. 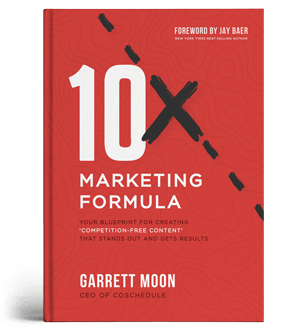 Garrett: Like I said, I think the blog and what we’ve done with content marketing is no better place to see where you just start, you go, and you get better over time. Hopefully that’s something that everyone can take and use as a repeatable process for the things that you need to learn how to do and build those muscles and those skills over time. Thanks for watching! That’s #OverheardAtCoSchedule.